Log in or Register for options to receive email notices when new products from Crate Paper arrive. Letter stickers, by Crate Paper, are waiting for you! 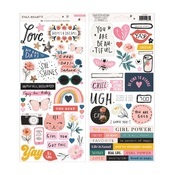 You always need some letters and numbers to decorate your albums, cards, or crafts, and these colorful stickers are exactly what you need. They come in various styles and colors to fit your different tastes.